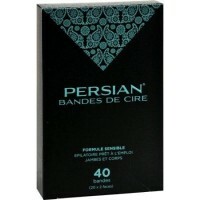 Ideal for beginners, delicate areas like bikini line, underarm and touch-ups. 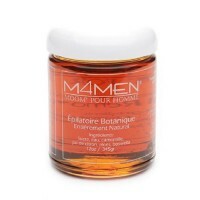 With Vitamin E and almond oil for sensitive skin. 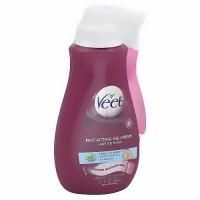 Ideal for bikini line and underarms. 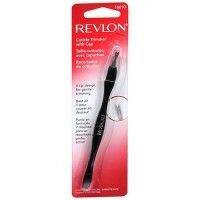 Ideal for beginners, delicate areas like bikini line, underarm, and touch-ups. 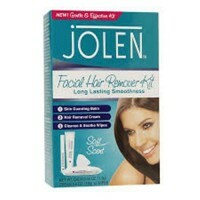 Long lasting results, enjoy smooth skin for up to 4 weeks. 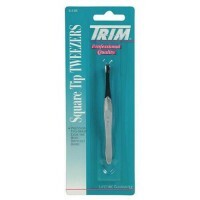 Now Shown to Work On Even Shorter Hair (1.5 mm). 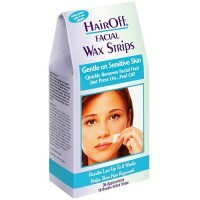 Grabs hair as short as 1.5 mm, so you can wait less time for your hair to grow back before waxing again. The specially developed grip tab helps you get great waxing technique for perfect results in one easy move. 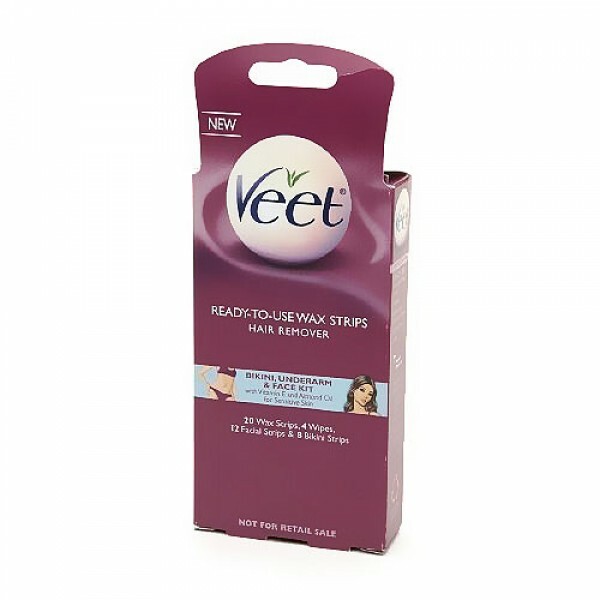 Care for your skin type, Veet wax strips are dye free and contain sweet almond oil and vitamin E, well known for their skin caring properties. 10 x 2 = 20 Re-Usable Wax Strips Total. 8 Bikini and Underarm Strips. Triethylene Glycol Rosinate, Glyceryl Rosinate, Silica, Polyethylene, Fragrance, Prunus Amygdalus Dulcis (Sweet Almond) Oil, Tocopheryl Acetate, BHA, BHT. 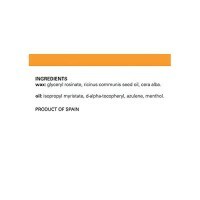 Wipes: Mineral Oil, Hexyldecyl Stearate, Fragrance, Tocopheryl Acetate, Citrus Aurantium Dulcis (Orange) Peel Oil, Cedrus Atlantica Bark Oil, Pelargonium Graveolens Flower Oil. Rub was strip between you hands for about 5 seconds to warm the wax. Slowly peel the two strips apart. Remember, each strip can be reused until it loses its grip. 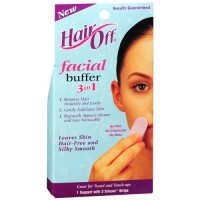 Place a strip onto your skin and rub repeatedly in the direction your hair grows. Hold your skin taut to avoid discomfort, and immediately. 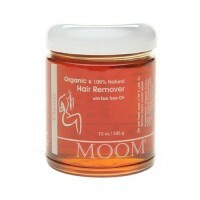 Very quickly, pull the strip back on itself against the direction your hair grows. The quicker the better! Repeat in consistent pattern until you have removed all the hair. 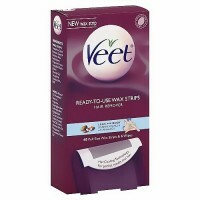 When you have finished waxing, remove any excess wax with a Veet perfect finish wipe. Follow all directions for use indicated on the leaflet inside the pack. Designed for use on underarm and bikini line, but not suitable for use on the head, breast, perianal, or genital areas or any other body parts. Do not use on varicose veins, scars, moles, broken, irritated, sunburnt skin, or on skin that has reacted badly to waxes in the past. Hair should be between 1.5 mm and 5 mm long. If the hair is longer trim it with scissors or clippers before you wax to avoid discomfort and damage to skin when waxing. 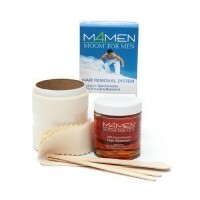 If you have not waxed before we recommend starting by removing hair from the legs. 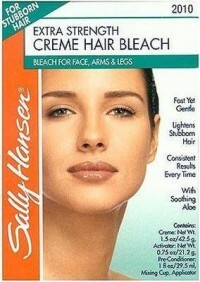 Only when you have experienced, then progress to the sensitive areas of underarm, bikini line, and face. We recommend not to wax the same area of skin twice during a waxing session. After waxing we recommend waiting 24 hours before using antiperspirant, any other perfumed product, using artificial tanning equipment, sunbathing, or swimming. Before every use, test your skin reaction by applying and removing the wax and wipe to a small part of the area you wish to treat, following the directions of use. 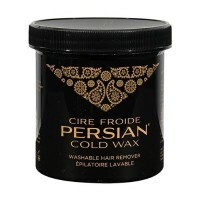 If after 24 hours there is no adverse reaction, begin waxing. Keep out of reach of children. If you experience any stinging or tingling when waxing, remove the wax immediately with the wipes or with the back of a used strip and rinse thoroughly with water or apply a cold compress. 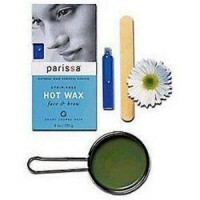 Waxing is suitable for pregnant women and may cause bruising.